Carl Frampton is training in Las Vegas in preparation for his WBA Featherweight title rematch against Leo Santa Cruz on January 28. ‘The Jackal’ landed in Vegas this week and has been working under the watchful eye of trainer, Shane McGuigan, and manager, Barry McGuigan, as he prepares to see off the threat of the three weight world champion at the MGM Grand casino. It will be a huge fight - as both men are confident of claiming victory - but Frampton says that after dealing with Santa Cruz he is aiming to have a massive 2017. “I want to be a three-weight world champion,” he told Sky Sports. “That is the goal. It wasn’t necessarily at the start of my career, but when you reach targets you set new goals and Steve Collins is the only other Irishman to hold world titles in different divisions, so I want to stand alone,” added Frampton. Frampton has also been linked with a featherweight unification fight with Lee Selby - which could happen at Windsor Park - and is convinced he will make it two wins out of two against Santa Cruz. 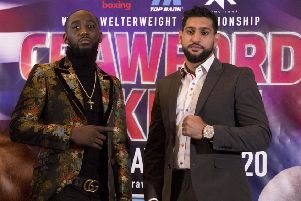 “I’ve been working hard and sparring well and although I am 30, I feel I am getting better and if I take what I’ve been doing into the gym so far in with me, I am going to win the fight convincingly,” he said. “We’ll pretty much be in Las Vegas for a month. When I was over last time, when I fought him in New York, we went over a month early and we don’t fix what’s not broken. But Santa Cruz believes he will get the job done this time around. “If I come in my best and he’s at his best it will be great fight and hopefully it is going to turn my way. “He’s a great fighter and a really smart fighter.